A while ago I bought some blue cheese for a recipe, and as usual, did use all of it. I seem to do this quite frequently and then I have a fridge full of half used ingredients just waiting to expire on me. So for the past couple of weeks, I’ve made a very concerted effort to find recipes using up what is in the fridge. Since I’ve actually done it so far, with nothing expiring on me first, I’m quite proud of myself. I’m not sure that without blue cheese currently in the fridge, this is a recipe I would have made. As from the souffle version, Tom still isn’t a big blue cheese fan, although he does like Gorgonzola. Strange, right? But since it was there, I figured it was worth a shot to see what he thought of it. 1. Preheat a grill to high heat. Line a baking sheet with foil. 2. Combine cream cheese through garlic in a small bowl. Add a pinch of salt and pepper. 3. Place the ground beef in a large bowl and season with salt and pepper. Form into 8 equally sized patties. 4. Divide the cream cheese mixture into 4 parts and place in the center of 4 patties. Top those patties with the remaining 4 patties and make sure to pinch the edges shut so the cheese won’t come through the burger. 6. 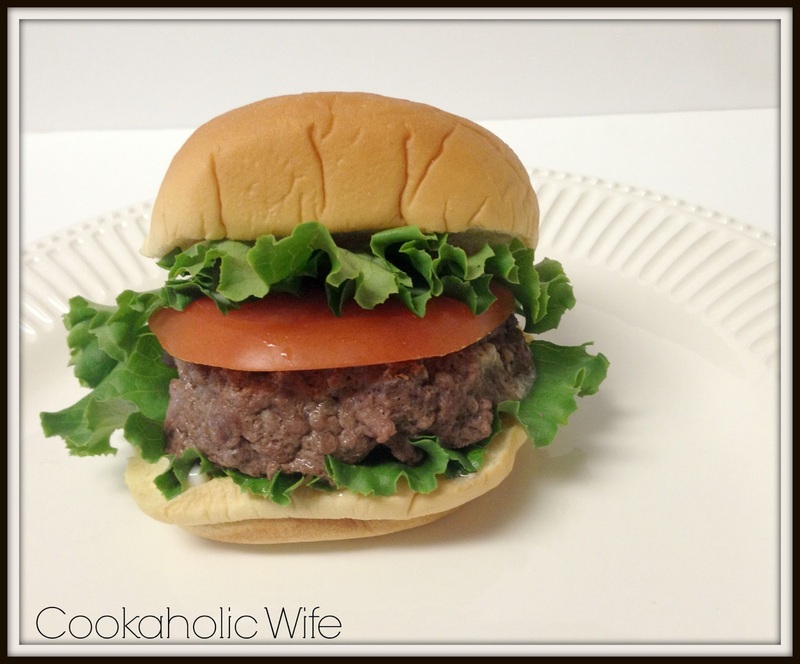 Place chilled burgers on the grill and cook for 5-7 minutes on each side or until cooked through. 7. Spread optional blue cheese dressing on both sides of the burger buns, top with lettuce, tomato and the burger. I was surprised to find the blue cheese flavor was kind of mild in these burgers and I’m really not sure why. I definitely tasted the burst of cheese in the center, but I guess I was expecting the more pungent flavors of blue cheese when eaten alone. Either way, I can never turn down a good burger and found that just a tiny bit of blue cheese dressing on the bun enhanced the flavor just enough. What DID Tom think of it? Ha I forgot to say! He didn't even taste the blue cheese because he said "so you just made regular burgers? No crazy ingredients or toppings? You feeling okay?" I have no idea how this was possible.